Mangaka Rumiko Takahashi will launch a new manga series in Shogakukan's Weekly Shounen Sunday magazine. 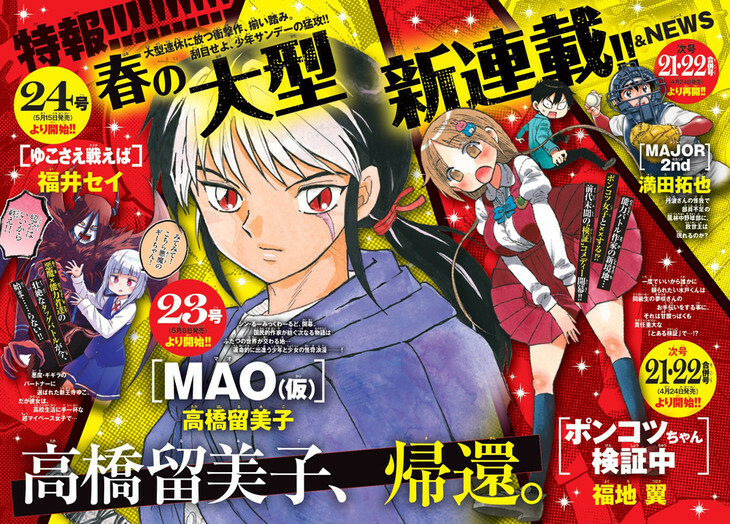 Previously hinted at in a December 2018 issue of Shounen Sunday, roughly one year after the conclusion of Kyoukai no Rinne, the manga titled MAO is set to appear in the magazine's 23rd 2019 issue to ship on May 8. The notice page describes the upcoming manga as a mysterious romance between a boy and girl from different worlds whose paths collide. Takahashi's career began in 1978, and after releasing three short series, she began publishing her breakout full-length series, Urusei Yatsura. Starting in October 1980, she was publishing Urusei Yatsura and Maison Ikkoku simultaneously, the latter quickly becoming one of Japan's most beloved romance manga. Both manga concluded in 1987, when Takahashi's Ranma ½ began its nine-year serialization. It stands as her most successful work, with approximately 53 million tankobon copies sold in Japan. Her next hit manga, InuYasha, was serialized from November 1996 to June 2008 and has sold 45 million tankobon copies. The anime was her first adaptation broadcast extensively in the West. Her latest work, Kyoukai no Rinne, sold 3 million copies as of 2014 prior to its anime adaptation, and its final volume ranked 32nd in weekly sales upon release. I've been reading Kyoukai no Rinne on and off for the past few years. Looking forward to her new work for sure. I didn't know she's still writing manga. Glad to hear her career is staying afloat! What a legend. Looking forward to her next work. Hot main boy. I can't find the main girl :O. Is she the one who has got brown hair? No that's the MC of Fukuchi Tsubasa's new manga that'll start next week. The main girl isn't drawn here. Same. Both were cool IMO. some her series might not be my taste, but damn man, you can't hate her dedication, her enthusiasm, and her effort. Jesus the women is a beast considering how brutal making manga is yet she's still making so much of it. Is she some kind of otherworldly being cause her stamina is superhuman. Wow, she's still going strong despite the tough industry and changing trends in popularity. Good luck and keep up the great work! Gonna rather of topic but I think this is @ImperfectBlue first job on news report. And I hope with the addition of new staff in news section somehow sales thread will be bought back. Yes!!! Can't wait to get more information about this. Not 100% sure if I'm into the design or not, but I'm sure it will turn out well. Of course it's about a girl, a boy and mysterious powers. Same formula but when she does it, her manga transforms into a great one. I see... a Kagome hater. I still think she is not brainless, I love her. Can't wait for Rumiko's new work. Hot main boy. I can't find the main girl :O. Is she the one who has got brown hair?